This model has been curated and unit-checked by Penny Noble of Oxford University and supports simulation of multiple action potentials. This model is known to run in COR and OpenCell. Introduction: The idea that sodium-calcium exchange might generate a current during cardiac electrical activity was first raised as a possible mechanism for the pathological situation when calcium-overloaded tissue generates the transient inward current responsible for ectopic beating. This was one of the mechanisms proposed by Kass, Lederer, Tsien, and Weingart in 1978. Mullins had already suggested on theoretical grounds that a variety of currents flowing across the cardiac cell membrane might be carried by sodium-calcium exchange. With regard to the transient inward current, the evidence that it is carried mostly (though not entirely) by sodium-calcium exchange is now very strong in ventricular cells,4 and it has proved possible to reproduce this mechanism in computer models of cardiac electrical activity. The purpose of the present paper is to review the evidence, experimental and theoretical, for a major role of the sodium-calcium exchange current during normal cardiac rhythm. Brown et al. and Arlock and Noble recorded slow components of inward current following the calcium current that were attributed to sodium-calcium exchange activated by the intracellular calcium transient, while Mitchell et al. and Schouten and ter Keurs showed that the exchange current could play a major role in maintaining the late low plateau in rat ventricular cells. Several years previously Simurda et al. showed that a component of inward current during weak depolarizations is directly proportional to contractile force, suggesting that it was calcium activated. Until 1987 it has to be admitted that these explanations were always subject to the criticism that the currents concerned were measured in highly complex situations with many other current components also present. Of course, if the role of sodium-calcium exchange during normal cellular activity is to be assessed, such experiments are necessary, and we will describe more of them later in this paper. But they need to be backed up by experiments done under conditions where the exchange current is isolated from other components. This was first achieved by Kimura, Miyamae, and Noma in 1987. The results were very relevant indeed, not only because they showed the electrogenic nature of the sodium-calcium exchange in cardiac cells (including demonstrating that its most likely stoichiometry was 3 : 1) but also because the current-voltage relations obtained were very similar to those required theoretically in modeling work to explain the results obtained in normal beating cardiac tissue. It is no longer necessary, therefore, to prove the hypothesis that sodium-calcium exchange contributes a significant electric current. The question now is rather a functional one: How large can this current be and can it be sufficient to be primarily responsible for maintaining calcium balance in the heart by generating the major component of calcium efflux? This is the hypothesis that led to the experimental and modeling work done by Hilgemann and Noble. In this paper, we will describe experiments done on atrial and ventricular cells that attempt to refine this hypothesis. We will raise the question of how the contribution of sodium-calcium exchange to the action potential varies with the region of the heart from which the cells come, with the ionic concentration levels (in particular of internal ion concentrations) and with inotropic state. 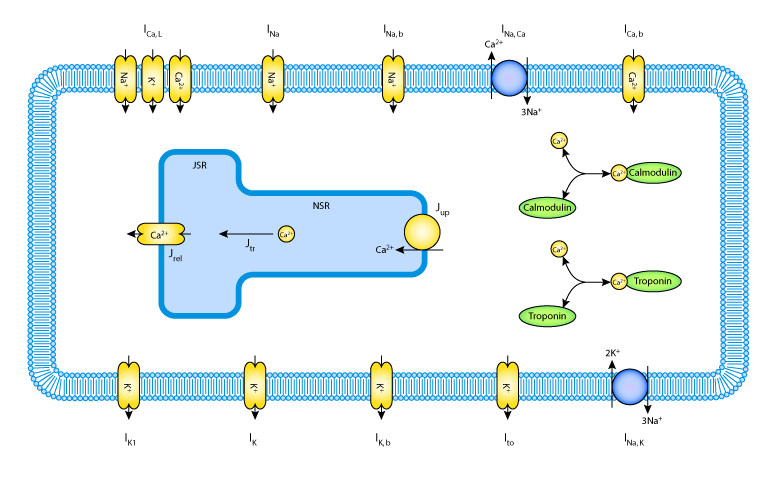 A schematic diagram describing the current flows across the cell membrane that are captured in the Noble 1991 model. Derived from workspace Noble, Noble, Bett, Earm, Ho, So, 1991 at changeset ac23e1a2b164.